Rabbit nutrition has two features. First, you need to give them lots of hard food, because these animals belong to the family of rodents, they have to grind off the teeth. Second, they eat very much because is rather fluid. And their cage should always be food. And decorative, and conventional rabbits fed almost the same. The only difference is the amount of feed. If meat breed can eat per day, just over a hundred grams of feed, Pets are limited to a maximum of half that weight. 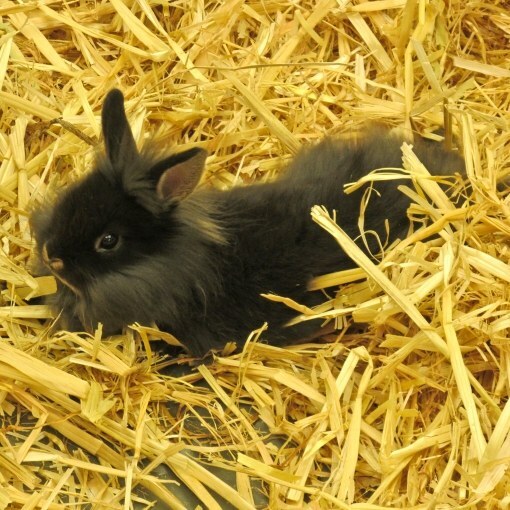 Rabbits eat frequently (up to 80 times per day), so the feeder should always be fresh hay. It is the basis of their diet. In rabbits there is no muscle that peristaltic, and the hay is just such a food which helps the bowel. Ie, if the rabbits will not eat hay, they could be in trouble with the digestive and excretory systems. Hay should be green, with many leaves. It should be dry, not wet. In spring and summer should also give fresh grass and leaves. For example, nettles, dandelions, clover, plantain, leaves of aspen, ash, Linden. But grass (fresh and dried) should not be the entire diet of the animals, especially the young, because because of this, they can stop the development. Rabbits also need to give fruits, vegetables and root crops: potatoes, squash, apples, beets, carrots (in principle, you can only give them clean). Before you give your pet food, thoroughly rinse and dry. Dust and earth can harm the digestive system of rodents. Also rabbits need to give concentrated feed: peas, oats, corn, lentils, bran, mixed fodder. Before feeding, soak the product for 10 minutes in water. Several times a week, Pets can be given dairy products: yogurt, milk, skim milk. The animal is not sick, add in food vitamin and mineral feed, salt and chalk. Regularly give your young rabbits the bark of trees: ash, oak, willow, Linden. This food will help them whittle down the teeth. Decorative animals you can also give a bit of special food. Before its acquisition read on the packaging the composition of the mixture. A quality product should contain about 20% crude fiber, 15% protein and a maximum of 1% fat.